WRITING DESK & CHAIR09650DIMENSION: D:48" x 23" x 31"H,C:40"HFEATURE: d..
1-Drawer Writing Desk Driftwood 801935Constructed from steel and driftwood,..
COMPUTER DESK12110DIMENSION: 47? "x 24? "x 30"?HFEATURE: espresso finishPacka..
COMPUTER DESK W/HUTCH12172DIMENSION: 72" x 24" x 88"HFEATURE: Cherry Oak Fi..
Model Number: 801916Dimensions:Width: 47.25 x Depth: 23.25 ..
2-Piece Nesting Table Chesnut And Chocolate Chrome 930116A two-piece nestin..
2-Piece Nesting Table Clear And Chrome 930117When you add a nesting set to ..
Make working from home a piece of cake with this 3-piece work station that .. Item Number : 30753Feature : DESKDimensions : 39" x 20" x 30.. Item Number : 30754Feature : HUTCHDimensions : 39" x 8" x 30..
4-Tier Shelf Desk F3055 Perfect for a small work space in your home, t..
Model Number: 400237Dimensions:Width: 48 x Depth: 21.5 x ..
Model Number: 400237+8Dimensions:Width: 48 x Depth: 21.5 ..
Model Number: 400896Dimensions:Width: 47.5 x Depth: 19.25 .. Subtle industrial influence is captured in the design of the Hilles Collect..
Mid-Century modern design is utilized to create a minimalistic look in the .. The unique height of the Penpoint Collection makes this a functional additi.. Finish ColorWEATHERED GREYMetal FinishCHROMEDescription	&..
Part of the 80175 Collection by Scott LivingModel Number: 801751D.. Finish ColorWENGEMetal FinishDARK BRONZEDescription	Width	Depth	HeightDRAFT.. Finish Color NATURALMetal Finish WHITEDescription	&.. Finish ColorWEATHERED OAKMetal FinishBLACKDescription &nbs.. Finish Color WEATHERED TAUPEMetal Finish SANDY BLACKDescription	..
Wood Finish METALLIC CHAMPAGNEDescription	Width	Depth	HeightCREDENZA	72.00	.. Finish ColorRUSTIC AMBERMetal FinishBLACKDescription	&nbs..
Wood Finish GLOSSY BLUEMetal Finish BRASSDescription	&nbs.. Finish Color WEATHERED OAKWood Finish RUSTIC COFFEEDescription &..
Wood Finish GLOSSY WHITEMetal Finish CHROMEDescription	&n.. Finish Color WEATHERED TAUPEMetal Finish GUNMETALDescription &nb.. Finish Color WEATHERED TAUPEMetal Finish GUNMETALDescription	&n.. Finish Color RUSTIC BROWNMetal Finish ANTIQUE BLACKDescription &.. Fabric Color BLACKMetal Finish BLACKDescription	&n.. Finish Color RUSTIC OAKMetal Finish BLACKDescription	&nbs..
SOFA TABLE82004DIMENSION: 59" x 26" x 29"HFEATURE: Cherry FinishPackage: PK..
COMPUTER DESK92040DIMENSION: 47? "x 36?" 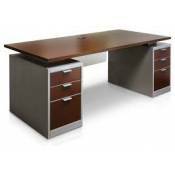 x 34"?HFEATURE: Silver chrome Metal..
2PC PACK DESK & CHAIR92044DIMENSION: Desk:35"x19"x30"H, Chair: 31"HFEAT..
2PC PACK DESK & CHAIR92046DIMENSION: Desk:47"x19"x29"H, Chair: 31"HFEAT..
COMPUTER DESK92062DIMENSION: 43"x 20"x 31"HFEATURE: chromed metal & whi..
COMPUTER DESK W/SHELVES92074DIMENSION: 47"x20"x54"HFEATURE: Chrome Plated b..
COMPUTER DESK92078DIMENSION: 43"X24"X36"HFEATURE: Black FinishPackage: PKG:..
Model Number: 800900Dimensions:Width: 60 x Depth: 30 x &n..
Keep your master suite up-to-date with this lovely vanity set. An oval mirr..